'Douce France' was built in 1998 by Alumarine and last refitted in 2015. This luxury vessel's sophisticated exterior design and engineering are the work of Van Peteghem Lauriot Prévost (VPLP). Her exterior is styled by the Van Peteghem Lauriot Prévost (VPLP) team who are also responsible for the entire engineering package. Douce France's interior layout sleeps up to 12 guests in 6 rooms, including a master suite, 1 VIP stateroom, 1 double cabin and 3 twin cabins. 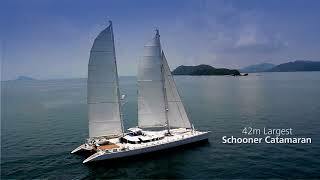 She is also capable of carrying up to 7 crew onboard to ensure a relaxed luxury yacht experience.